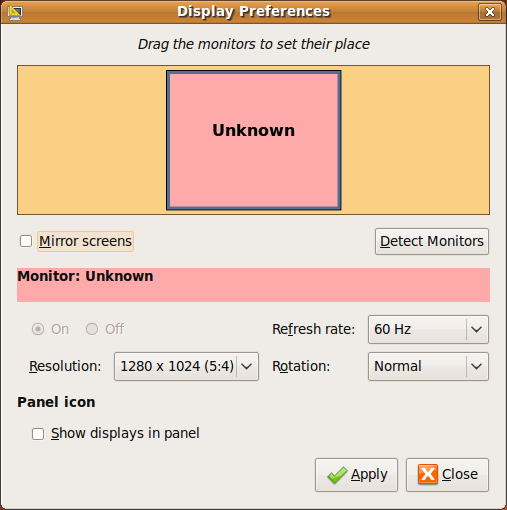 When a new Virtual Machine, or Virtual PC, is setup in Virtualbox for Ubuntu, or another Linux flavor, the screen size and screen resolution may be fixed smaller than your maximum resolution setting. This problem can be fixed by installing Guest Additions. 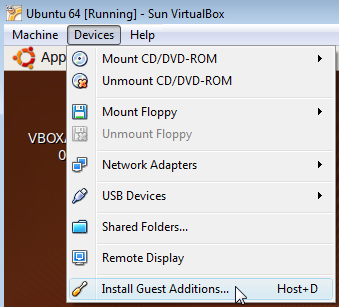 Guest Additions comes with Virtualbox, but is installed after you setup your Virtual Machine, or Guest OS, to add features such as increased screen size or screen resolution. On the test PC for this example the maximum resolution is 1280 x 1024. 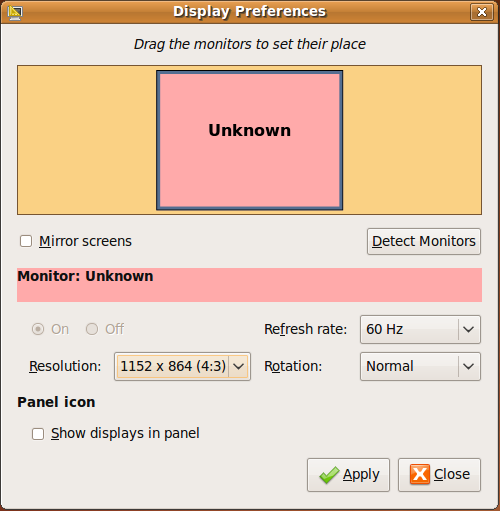 After loading Ubuntu under Virtualbox bring up the Display Preference by going into System -> Preferences -> Display. The maximum resolution option listed is 800 x 600. To get a bigger screen resolution we will need to install Guest Additions. 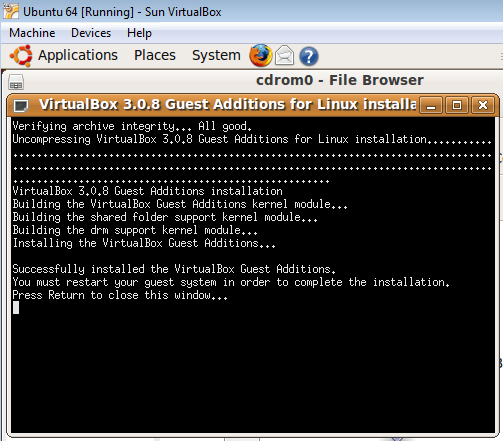 On the Virtualbox File Menu click on Devices -> Install Guest Additions. 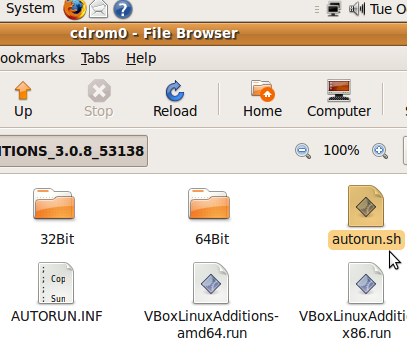 You should now see a vboxadditions_x file now located on your Ubuntu desktop. 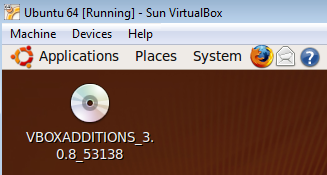 To open the vboxadditions file either double click on the file, or right-click and then click Open. Now double click the autorun.sh file. 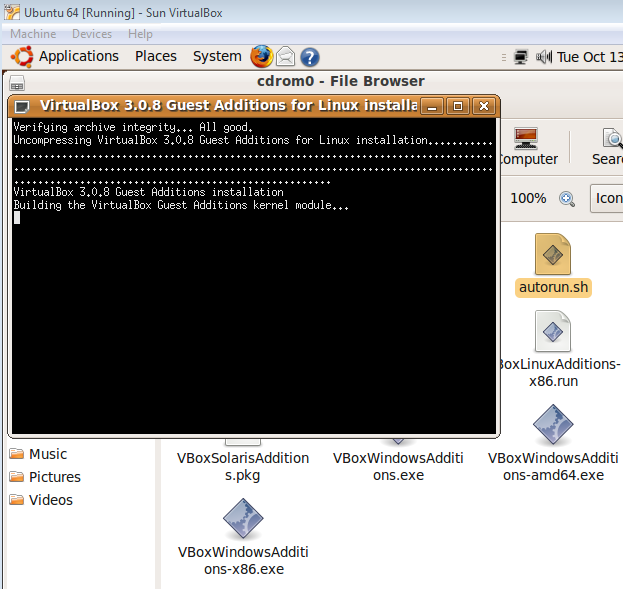 The vboxadditions file contains installation choices for a few different Linux versions including both 32 bit and 64 bit versions. 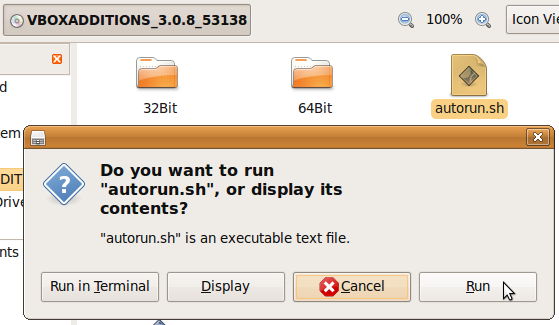 By using the autorun.sh file you allow the script to automatically detect, and install the right software for your OS. The autorun.sh will open a Shell window and begin installing the files. Once the autorun.sh file has completed installing the Guest Additions software all you have to do is hit Enter to close the Window. Now reboot Ubuntu for the new files to load properly. After you return to the Ubuntu desktop click System -> Preferences -> Display. Under Display Preferences you will see the resolution is at 1152 x 864, which is still not the maximum resolution. 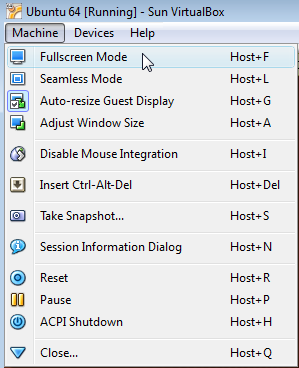 On the Virtualbox File Menu click on Machine -> Fullscreen Mode. Once in Fullscreen Mode go to System -> Preferences -> Display again, and you will now see the maximum screen resolution is 1280 x 1024.